WHAT a pleasant surprise to catch up with David Martin from Claremont the other day when he rolled in to Mood Food. We first met up some years ago at Tea Tree and well remember his desire to drive trucks even back then. Well here he was and what a truck it is, the gleam of its livery almost blinding us in the winter sunshine. For here was a pristine 2012 SRT Logistics' R560 Euro 5 V8 Scania with auto gearbox and all the bells and whistles towing a refrigerated B-double. David was on his way from Hobart to Launceston to the TRDC and he tells us he has been driving for SRT Logistics for a couple of years. 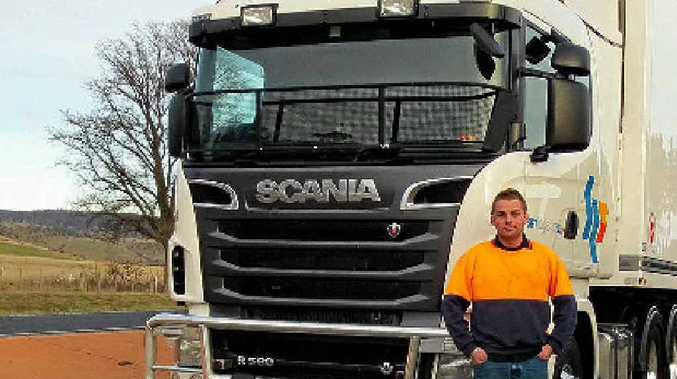 He says they are a great outfit to drive for, good people and fantastic well maintained gear, and especially the Scania which he described as a truly top truck in every way. He also tells us his father Kevin is now days living in Geraldton in W.A. and driving road trains and we would like to wish Kevin and the entire family our best wishes. We were also happy to see David purchase a Marion Bay free range chicken roast from Natalie Bennetto, who told us it is a new and welcome offering at Mood Food, packed hot and ready to go, and just right for this cold winter weather!